As a general rule, I tend to opt for rich salt scrubs suspended in balm style formulas for indulgent and thorough exfoliation. However, at this time of year, I like to use a lighter body scrub for a gentle exfoliation which keeps my tan looking fresh whilst maintaining the hint of colour and the Moroccan Black Olive & Argan Oil Scrub from The Body Shop's Spa Wisdom range fits the bill perfectly. 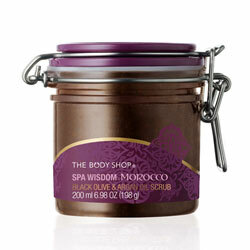 I rather like The Body Shop's Spa Wisdom range for affordable home pampering and recently included the Moroccan Black Olive & Argan Oil Body Scrub in a home spa piece for one of the magazines I write for. Although not the most functional (a tube would work bettter with the texture of the scrub), I really like the packaging which looks fab in the bathroom. The gel itself feels very soft and the texture reminded me of lightly set jelly, without the stickiness. I expected to have to use a lot so was pleasantly surprised that you only need to use a little. During use, the scrub is so gentle that it doesn't feel effective so if you like to feel your products working, this might not be the best choice for you. Having said this, my skin was left feeling soft and smoother than I antipated. The effects weren't to the same extent as with a salt scrub but I didn't want them to be so this lived up to my expectations and for this reason, I'd happily pay the reasonable £12 pricetag for 200ml. The scent is difficult to describe but certainly not unpleasant and lingered delicately on my skin. Just a couple of bugbears..The ingredients list does seem unnecessarily long and filled with unprounacable preservatives and suchlike but then I admit to being biased as I prefer my products natural. And finally, a word of warning- this left a real mess in my shower as the olive stone granules don't dissolve in the same way as a salt or sugar based scrub does.